Our Dog Days Atlanta Buckhead facility is located near The Shops, Lucy's Market, and the St. Regis in Buckhead. Next to Churchills Pup is where you'll find us. We have a big orange Frenchie on the side of our building! If driving on 400, take exit 2. Since 1999, Dog Days has been providing the Buckhead area of Atlanta with a fun and safe Dog Daycare and Dog Boarding environment that your dog can utilize as an outlet for energy. We believe consistent interaction and attention to dogs is vital for making happier pets. Furthermore, we believe a smaller dog daycare and dog boarding facility creates a more intimate environment, where special needs can be met and unique personalities recognized. By taking fewer dogs, we can guarantee proper supervision for each individual pet. Our Buckhead location provides play-all-day dog daycare, luxury dog boarding and dog grooming services, as well as unique accessories, and all-natural and/or organic dog food and dog treats. All this while you watch your dog play all day on our state-of-the-art web camera! 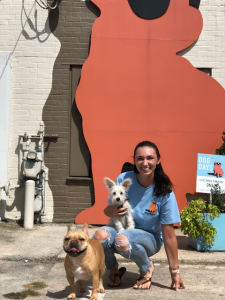 Haley Dunne is currently the Manager at Dog Days Atlanta's Buckhead location. She is a former Team USA Figure Skater and member of the Athlete Advisory Committee. Haley is studying Industrial Organization Psychology at the University of Georgia and she's never met a book that she didn't like to read. She's lived in Paris and has watched Animal Planet every single day growing up as a child. Haley love's every single one of the dogs that comes into our Dog Days Buckhead location. 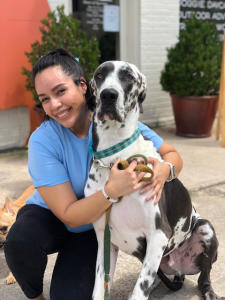 Carmen Delgado is currently the Assistant Manager at Dog Days Atlanta's Buckhead location. She is currently attending Georgia State University in pursuit of a BS in Psychology. Carmen plays the flute and has been in band throughout high school and some college. She was raised in Miami and has had various pets growing up including rabbits, mice, hamsters, cats and birds. She owned a Golden Retriever for 9 loving years and is currently the mom to two cats and a bearded dragon. Carmen is living the dream working at Dog Days Buckhead and seeing wonderful dogs every day. $50.00 per 24-hour period – includes day care, special feedings, administering medication, etc. Memberships are non refundable and expire 1 year from purchase.